Republic Bank is now accepting ERO applications for the 2018 tax season. With over 20 years of experience in the e-file industry and competitive program features, Republic Bank is the right choice for your business. TaxAct 2018 Professional Editions provide the option to offer your clients $6,000, $3,000, $2,000, $1,500 or $500 as an Easy Advance, with funding and underwriting by Republic Bank & Trust Company. If approved, a Finance Charge will apply. The process is built into one application in TaxAct 2018 Professional Editions for all Republic Bank products. Easy Advance amount is based on net refund (taxpayers' expected refund amount after deduction of all fees) so you know how much your clients are applying for. Customers can choose which loan amount to apply for based on their net refund. Refund Transfer NOT required to apply, but you must be enrolled for Republic Bank's Refund Transfer Program. Available for all disbursement types with a Refund Transfer: check, direct deposit, a prepaid card, or Walmart Direct2Cash3. If clients do not choose a Refund Transfer, disbursement options are direct deposit or prepaid card. Republic's Easy Advance program is offered at no cost to your clients. Cost is deducted from your tax preparation fees and cannot be passed to the taxpayer. In order to offer Easy Advance to your clients, you must be approved for Republic Bank's Refund Transfer Program. Easy Advance will only be offered through February 28, 2019. *All information is as of November 2018 and subject to change. Low Cost Leader Option - $29.95 per Refund Transfer1 and $3 for any additional fundings, you'll have the lowest price around! Revenue Share Option - $39.95 per Refund Transfer1 and $10 for any additional fundings, you'll get an $8 revenue share off the first funding we receive and a $5 revenue share off any additional fundings. With Republic Bank, there are no volume requirements, incentive tiers or complicated calculations! Plus, you can earn an additional $5 revenue share for each Visa Prepaid Card that you issue! Receivables Assistance4: Republic Bank will provide advance payment of 50% of your tax preparations fees on all acknowledged returns with RT's at the beginning of filing season to help with your financial needs until the IRS funding begins. preseasonRAP5: EROs can get up to $40,000 in preseason Receivables Assistance. Republic Bank will provide an advance payment in early December to approved EROs. Taxpayer Text Updates6: Save time and resources by letting Republic Bank notify your customers with a text messages when their checks are ready for pick up or their direct deposit has been released! Mobile Phone App6: Republic Bank's app will let you know how many checks you're going to print today, how much in fees you're getting, and more. If you are interested in offering Refund Transfers and/or the Easy Advance, enroll today with Republic Bank to make sure you're set up in time for tax season. For more information, visit www.republicrefund.com or call 1-888-676-2056. Refund Transfers and Easy Advances are offered by Republic Bank & Trust Company, Member FDIC. 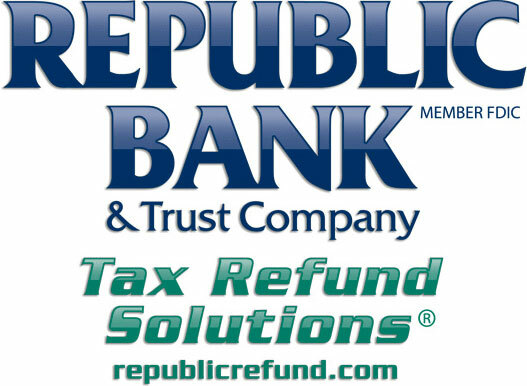 1 A Refund Transfer is a fee-based product offered by Republic Bank & Trust Company, member FDIC. A Refund Transfer Fee and all other authorized amounts will be deducted from the taxpayer’s tax refund. 2 ERO must be enrolled for Republic Bank’s Refund Transfer Program to offer the Easy Advance programs. Cost to ERO per approved Easy Advance will be deducted from ERO tax preparation fees and cannot be passed to the taxpayer. If a customer does not choose a Refund Transfer, disbursement options are direct deposit or prepaid card. Net Refund refers to the taxpayer’s expected refund amount after deduction of all fees. 4 ERO's signed up for RAP are charged a 2% origination fee on each dollar loaned that is paid from tax preparation fee disbursements. 5 ERO's signed up for RAP are charged a 3% origination fee on each dollar loaned that is paid from tax preparation fee disbursements. 6 Message and data rates may apply from the wireless carrier.